A new generation observatory to explore the high energy Universe. Une nouvelle génération d'observatoire pour explorer l'Univers à haute énergie. We are opening a post-doctoral position essentially for the development of the data pipeline. The deadline for application is November 15th, 2018 for a start beginning 2019. An artist’s view of the observatory in CTA, here in the Southern Hemisphere. It is comprised of telescopes of different sizes that cover complementary energy ranges from 20 GeV to 100 TeV – (c) G Perez, IAC. The CTA (Cherenkov Telescope Array) Observatory is a next-generation ground-based instrument for exploring the sky in gamma rays. CTA covers a large energy range, from 20 GeV to over 100 TeV, a domain that well complements that of the Fermi satellite (100 MeV – 300 GeV). It will produce images of the sky with a sensitivity and angular resolution that are ten times better than its predecessors (HESS, MAGIC, VERITAS). The CTA consortium is composed of 1200 scientists from 30 countries, working in over 190 laboratories. 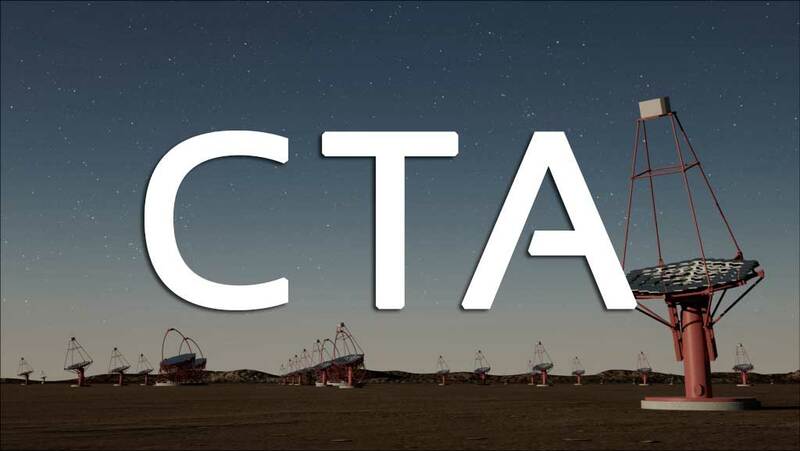 CTA’s primary objective is to study cataclysmic phenomena in the universe. These are expected to be the origin of cosmic rays: the incessant rain of particles detected in the atmosphere more than one hundred years ago of which the origin is still unknown. These phenomena typically include compact stars, black holes, or neutron stars, which allow for the study of matter under extreme conditions. Gamma rays may also trace the presence of particles of dark matter that self-annihilate in dense regions in the universe, like the center of the Milky Way. Their absorption permits us to probe the diffuse background of optical and infrared radiation in the universe. 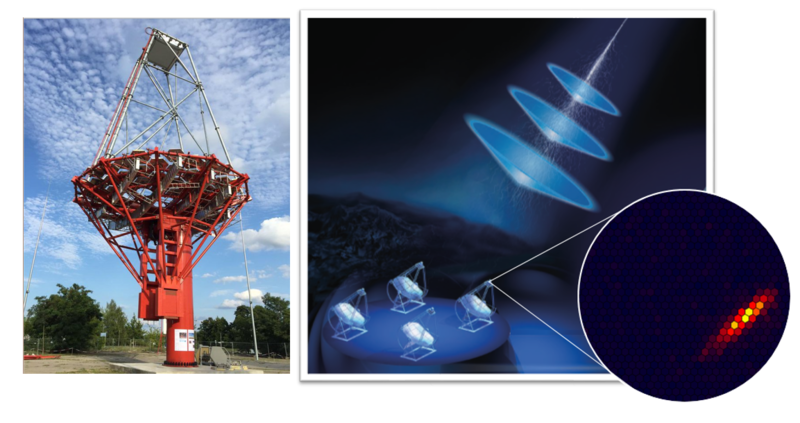 Left : A CTA telescope prototype – (c) Consortium CTA. Right : The Atmospheric Cherenkov detection principle. 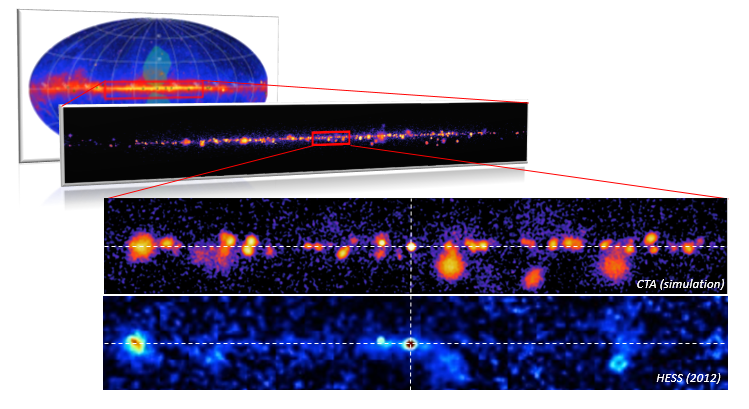 A gamma ray interacts in the atmosphere at an altitude of about 15 km. It creates a shower of particles propagating at nearly the speed of light, thus leading to the emission of a thin bluish conic light beam, known as Cherenkov light. The light propagates to the ground where it illuminates a telescope mirror reflecting the photons to a camera consisting of a grid of photomultiplier pixels. CTA is in the process of being deployed on two sites in order to cover the entire sky. In the Southern Hemisphere, the site will be situated near the Paranal Observatory in the Atacama Desert north of Chile, which also hosts the VLT. It will be composed of about a hundred telescopes and will provide a view of the interior regions of the Galactic Plane. In the Northern Hemisphere, the Roque de los Muchachos Observatory on the Canary Island of La Palma will host around 20 telescopes and will have the principal goal of exploring the extra-galactic universe. On the right : Top image, view of the southern CTA site, Paranal, Chile (c)ESO; Bottom image, View of the northern CTA site, La Palma, Spain (c) Miguel Claro. View of the galactic plane and zoom of the ±10° longitude region around the galactic Centre. The image shows what CTA will detect after a few years compared to the existing HESS view (The CTA view is obtained from a simulation extrapolating the known populations of supernova remnants and pulsar wind nebulae). In CTA a few hundred of high energy sources are expected, whereas only a few tens are known today. © Collaboration HESS, Consortium CTA, Th. Stolarczyk for the montage. The SAp group comprises a dozen researchers from LEPCHE and LISIS who already use or will use data from other telescopes like HESS, satellites like Fermi, Integral, XMM-Newton, and the neutrino telescope Antares. The scientific themes covered by the group range from galactic astrophysics (supernova remnants, X-ray binaries, pulsars, and diffuse flux…) to gamma-ray bursts, in collaboration with the SVOM group in DAp. The group is involved in the preparatory work in data analysis, in particular with the development of innovative tools for the reconstruction of atmospheric showers and the analysis of sky images, as well as adapting them for real-time operation for the detection of gamma-ray bursts or other transient sources. The group is developing its scientific program by participating in the definition of future observations by the consortium. The CTA team at DPhP is composed of physicists also participating in the astroparticle experiments H.E.S.S. (very high energy photons) and ANTARES (very high energy neutrinos). The group has activities related to hardware (cameras, mirrors for telescopes of the new observatory), but also to the preparation of the exploitation of physics (Galactic Center, dark matter, axions, Lorentz invariance tests, counterparts optical events gravitational waves and more generally physical multi-wavelength, etc.) with their colleagues from DAp. The group of the DPhP is composed in 2018 of 7 physicists, 1 postdoctoral fellow and 3 PhD students. The group (which includes the scientific leader of the NectarCAM camera) is involved in verifying the performance of the NectarCAM camera and preparing the data collection on the CTA site. He works closely with IRFU's technical departments who are responsible for camera management (including the NectarCAM project manager) and integration. He also works in close collaboration with CNRS, DESY-Zeuthen, CIEMAT and UCM GAE (Madrid), ICC-UB and IFAE (Barcelone) groups. The group is responsible for providing lightweight mirrors for CTA's MST telescopes. He works in close collaboration with the technical departments of the IRFU.